NORMAL C'ETAIT UN TOP POTE! 27 MAI-LE NOTRE A VILLENEUVE SUR YONNE 89!!!!!!! J'AIMERAIS QUE MA VOITURE AVANCE PLUS VITE MAIS COMME ON DIT CHAQUE CHOSE EN SON TEMPS. JE METTRAIS CERTAINEMENT DES MOIS A FAIRE MA VOITURE MAIS J'Y ARRIVERAI. PARFOIS DEGOUTEE DE LA MENTALITE DE CERTAINS TUNERS. 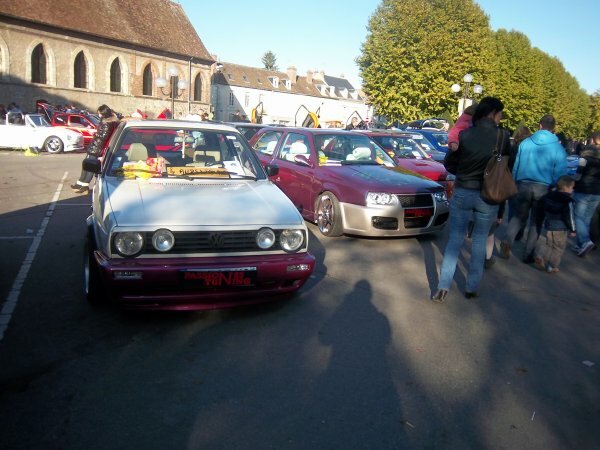 JE ME REND COMPTE QUE LE MILIEU DU TUNING EST BOURRE DE PERSONNES RONGEES PAR LA JALOUSIE. JE SUIS UNE FEMME JE FAIS DU TUNING ET J'AI UNE GOLF 2 GTI 16S, OUI ET ALORS? Détails : EASTMAN KODAK COMPANY KODAK EASYSHARE M550 Digital Camera, flash, ISO 100, F 3.5, 3125/1000000 s.
Détails : EASTMAN KODAK COMPANY KODAK EASYSHARE M550 Digital Camera, sans flash, ISO 64, F 3.5, 3125/1000000 s.
Détails : EASTMAN KODAK COMPANY KODAK EASYSHARE M550 Digital Camera, sans flash, ISO 64, F 3.5, 4000/1000000 s.
Détails : EASTMAN KODAK COMPANY KODAK EASYSHARE M550 Digital Camera, flash, ISO 100, F 3.5, 2500/1000000 s.